Yeshiva University is a private university in New York City, with four campuses in New York City. Founded in 1886, it is a research university. The university's undergraduate schools—Yeshiva College, Stern College for Women, and Syms School of Business—offer a dual curriculum inspired by Modern-Centrist-Orthodox Judaism's hashkafa (philosophy) of Torah Umadda ("Torah and secular knowledge") combining academic education with the study of the Torah. 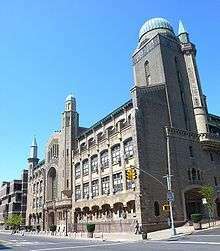 Yeshiva is perhaps best known for its secular, highly selective graduate schools, the Albert Einstein College of Medicine and the Benjamin N. Cardozo School of Law. The Forward announced on May 27, 2014 that Yeshiva would be shedding the financial burden of the Albert Einstein College of Medicine when the medical school is taken over by the Bronx-based Montefiore Health Systems. While the majority of students at the University are of the Jewish faith, many students, especially at School of Law, the College of Medicine, and the School of Business, are not Jewish. Yeshiva University is an independent institution chartered by New York State. It is accredited by the Commission on Higher Education of the Middle States Association of Colleges and Schools and by several professional agencies. The University's main campus, Wilf Campus, is located in Washington Heights. A 1928 plan to build a spacious Moorish Revival campus around several gardens and courtyards was cancelled by the Great Depression of 1929 after only one building had been erected. Building continued after the Depression in modern style and by the acquisition of existing neighborhood buildings. Since it was founded in 1886, Yeshiva University has expanded to comprise some twenty colleges, schools, affiliates, centers, and institutions, with several affiliated hospitals and health care institutions. It has campuses and facilities in Manhattan (Washington Heights, Murray Hill, Greenwich Village), the Bronx, Queens, and Israel. The Yeshiva University Museum is a teaching museum and the cultural arm of Yeshiva University. Founded in 1973, Yeshiva University Museum is AAMG accredited and aims to provide a window into Jewish culture around the world and throughout history through multi-disciplinary exhibitions and publications. The U.S. News and World Report's 2017 "America's Best Colleges" ranked Yeshiva University as the 66th best National University. Yeshiva University's Albert Einstein College of Medicine was ranked 38th in the nation in research and 51st in primary care, and its Cardozo School of Law was ranked number 75 among law schools. It ranked #5 in Dispute Resolution & #7 in Intellectual Property Law. Notable graduates of Yeshiva University include author Chaim Potok (B.A. 1950), diplomat Daniel C. Kurtzer (B.A. 1971), former Speaker of the New York State Assembly Sheldon Silver (B.A. 1978), former Governor of Vermont Howard Dean (M.D. 1978), Triple Crown-winning racehorse owner Ahmed Zayat (B.A. 198? ), baseball executive David Samson (J.D. 1992), and restaurateur and writer Eddie Huang (J.D. 2008), in addition to a number of prominent rabbis. Notable faculty members past and present of Yeshiva University include Nobel Prize-winning neuroscientist Paul Greengard and Pulitzer Prize-winning novelist Herman Wouk. ↑ "U.S. and Canadian Institutions Listed by Fiscal Year 2011 Endowment Market Value and Percentage Change in Endowment Market Value from FY 2010 to FY 2011" (PDF). Copyright 2012 National Association of College and University Business Officers and Commonfund Institute. Retrieved March 10, 2012. ↑ "Mission Statement". Yeshiva University. Retrieved August 27, 2010. ↑ "Yeshiva University Accredited". Retrieved July 20, 2009. ↑ "About Yeshiva University". YU.edu. August 2012. Retrieved October 16, 2012. ↑ "Dr. Bernard Revel, Head of Yeshiva, 55 — President of Hebrew College Here for the Last 25 Years Succumbs in Hospital — Son of a Russian Rabbi — Was Founder of Talmudical Academy and an Associate Editor of Encyclopedia". New York Times. December 2, 1940. p. 23. Retrieved 18 November 2016. ↑ "Elected as President Of Yeshiva at Age of 32". New York Times. June 29, 1943. p. 17. Retrieved 18 November 2016. ↑ Spiegel, Irving (September 9, 1975). "Belkin, Citing Illness, Resigns as Yeshiva President". New York Times. p. 29. Retrieved 18 November 2016. ↑ Spiegel, Irving (August 9, 1976). "New Head of Yeshiva U. Norman Lamm". New York Times. p. 18. Retrieved 18 November 2016. ↑ Medina, Jennifer (August 28, 2002). "Wanted: University President/Religious Leader". New York Times. Retrieved 18 November 2016. ↑ Bronfman, Edgar M.; Schusterman, Lynn; Steinhardt, Michael; Moss, Neil M. (December 5, 2002). "Richard Joel Named Yeshiva University President". Hillel. Retrieved 18 November 2016. ↑ Berger, Joseph (November 18, 2016). "Yeshiva University Names Ari Berman President". New York Times. p. A28. Retrieved 18 November 2016. ↑ "Building Bust — The Unbuilt Synagogues of the Great Depression". Tablet Magazine. August 20, 2009. ↑ "Yeshiva University Campus Map" (PDF). ↑ "Yeshiva Maccabees homepage". Yeshiva Maccabees. Retrieved August 27, 2010. ↑ Goldstein, Richard (March 10, 2010). "Henry Wittenberg, Champion Wrestler, Dies at 91". The New York Times. Retrieved March 10, 2010. ↑ "Players From Nine Countries Find Common Goal in Men's Soccer Team". Yeshiva University News. Yeshiva University. November 11, 2008. Retrieved August 27, 2010. ↑ Mike Spinner (December 6, 2007). "Two former Yeshiva University Baseball players to compete in new Israeli Baseball League". Yeshiva Sports Information. Skyline Conference. Retrieved August 27, 2010. ↑ "Championships – Hudson Valley Intercollegiate Athletic Conference". hvmac.net. Retrieved June 11, 2014. ↑ "Yeshiva University Athletics – Cohen Named to Capital One Academic All-District 3 NCAA Division III Men's Track/Cross Country Team". yumacs.com. Retrieved June 11, 2014. ↑ "Yeshiva University Athletics – Elizabeth Penn Earns Fencer of the Year Honors. Shaul and Goldson Earn 2nd Team at EWFC Championships". yumacs.com. Retrieved June 11, 2014. ↑ "Yeshiva University Athletics – Yoshor Named to All Met Division III Women's College Basketball Second Team". yumacs.com. Retrieved June 11, 2014. ↑ "Men's Tennis Repeats as Skyline Conference Champions, Beats Farmingdale State 5-4". Yeshiva University. Retrieved 2016-06-21. ↑ "Men's Tennis Beats Colby-Sawyer in First Round of NCAA Tournament for First NCAA Tournament Win in Yeshiva Athletics History". Yeshiva University. Retrieved 2016-06-21. ↑ "Men's Tennis History Making Season Ends with 5-0 Loss to Amherst in NCAA Tournament Second Round". Yeshiva University. Retrieved 2016-06-21. ↑ "Three-peat! Men's Tennis Defeats Farmingdale State to Capture Third Straight Skyline Title". Yeshiva University. Retrieved 2016-06-21. ↑ "Official Home of the Yeshiva Maccabees - List of Championships". www.yumacs.com. Retrieved 2016-06-21. ↑ "Didn't Think Tolerance Could Be Controversial? Welcome To Yeshiva University". May 5, 2009. Retrieved September 26, 2013. ↑ "National University Rankings". U.S.News & World Report LP. September 13, 2016. Retrieved September 13, 2016. ↑ "Best Medical Schools – Research". U.S.News & World Report LP. September 10, 2013. Retrieved September 10, 2013. ↑ "Best Medical Schools – Primary Care". U.S.News & World Report LP. September 10, 2013. Retrieved September 10, 2013. ↑ "Best Law School Rankings Care". U.S.News & World Report LP. December 13, 2015. Retrieved December 13, 2015. ↑ The Washington Monthly College Rankings, Washington Monthly. Retrieved September 10, 2013. ↑ "World University Rankings". The Times Higher Educational Supplement. 2012. Retrieved September 10, 2013. ↑ "Academic Ranking of World Universities – 2012". ARWU. ShanghaiRanking Consultancy. Retrieved September 10, 2013. ↑ "QS World University Rankings 2013 Results". TopUniversities. QS Quacquarelli Symonds Limited. Retrieved September 10, 2013.